ERNIE, our guide, obviously wasn't joking when he told us that Cornish miners used to be pretty small. We're making our way through a 200-year-old tin mine at Geevor and to say it's cramped would be an understatement. Much of the time we have to walk bending over to stop our hard hats smacking into the roof. As Ernie put it, "If you're a bit tall you've wasted your money because all you're going to see is your feet." And most of the tunnels are so narrow that even a skinny guy like me finds it tricky to fit through. How the big bloke in front of me has managed to squeeze past the rough stone walls I don't know. Luckily I'm at the end of the line so if he gets stuck I can always go back the way I came... if I can find the right tunnels in the maze that makes up this Wheal Mexico mine. It's pitch dark in the mine when Ernie asks everyone to turn off the helmet lights so we can get a feel for the atmosphere underground. But at least our lights are easy to switch back on. A couple of centuries ago the only light was provided by candles made of sheep fat. "The candles were made to last two hours, so they also acted as timekeepers. When one miner had burned six candles he knew his 12-hour shift was over." Ernie also tells us that back in the 1790s, when this mine was in its heyday, miners would have spent 10-12 hours underground, hence the development of the Cornish pasty to provide a nourishing meal they could easily eat underground. "They used a hammer and a poker to break up the rock," he says, "and it was slow work. "Often they'd dig only 10cm a day into the mine face. But over time they cut huge networks of tunnels. Tin has been mined here for over 2000 years and the whole place is a maze of diggings." There are more than 1000 mine shafts in the St Just mining area alone. The vertical shafts were mainly used to allow the spoil, packed into large woven baskets, to be hauled to the surface by rope, pulley and horse, though some also served as escape routes. We passed three shafts while we were underground, one with a basket hanging on a rope, and a second with a ladder leading to the surface about 20m above. According to Ernie, "When the baskets got to the surface the local women would tip the rubble out, crush it with big hammers and sort out the useful minerals, mainly tin, wolfram, iron, zinc, lead, arsenic and sometimes gold and silver." 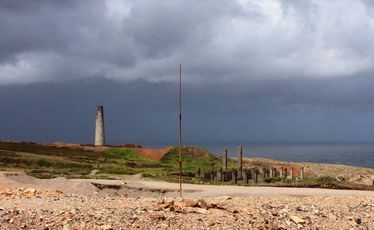 Inevitably there was a lot of spoil left afterwards and, as it happens, that's why we were able to explore the Wheal Mexico a couple of centuries after it closed. "Often these old mines were filled in but in this case the entrance was hidden under a heap of waste and forgotten about. It was only when the waste was cleared away a few years ago that it was found again and renovated so it could be used as a tourist attraction." It was a tight squeeze, but it was a fascinating experience to go through a primitive tin mine. But back on the surface there's a lot more to be seen. Created around a modern tin mine, which closed in 1986 and was turned into a museum in 1992, Geevor tells the story of tin mining from the hammerstones, deer-antler picks and wooden shovel heads the first miners used, to the modern mine with its tunnels extending 1.5km under the sea and its huge automated processing plant. There's a marvellous exhibition on the mineralogy of the area; you can go gold panning if you wish. I had fun pretending to drive the massive steam winch that once sent the lift down 650m, and the photos and exhibits recreate the harsh but companionable life of the tin miners of old. There's even a special Cousin Jack Room - the name given to the tens of thousands of tin miners who emigrated to places such as Australia and South Africa - including a poster from the 1840s offering free passages to New Zealand for skilled miners. The skills they brought with them played a key role in developing the mines, roads and railways in the new world.